The Ultimate Guide to Make Your Home "Airbnb Ready"
How do you get your unfurnished home ready to plug-and-play for Airbnb guests? How do you design your Airbnb to have your guests come back, again and again? Imagine: You have a raw piece of space, in a great location, with the intent to leverage the Airbnb market. Furnishing, accessibility, utility, style, and cleanliness are the beginning to make your apartment Airbnb friendly. Here are small things often forgotten and important things to always include when welcoming guests to your Airbnb. 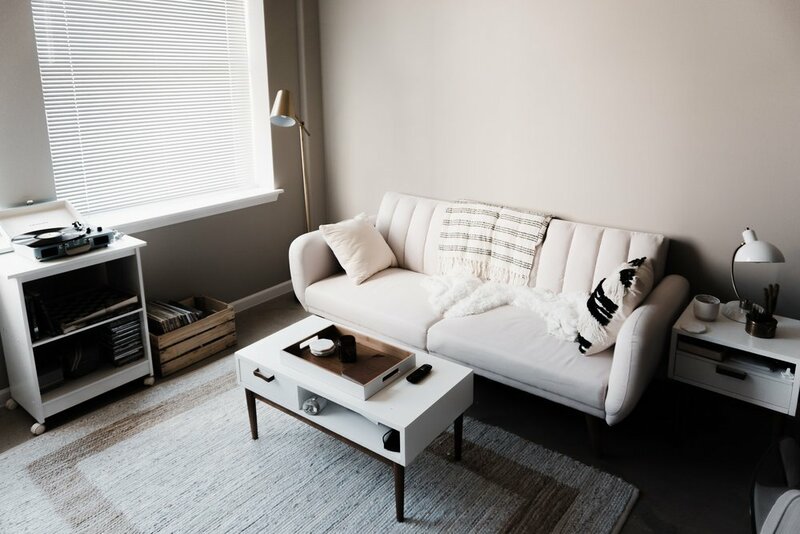 When it comes to buying furniture for your Airbnb in Chicago, your personal taste and style can go a long way. Don't be afraid to be "funky." First thing, designing and furnishing your airbnb means putting yourself in the shoes of future guests. By focusing on the design and functionality, you can design an airbnb in Chicago that results in happy guests, 5-star reviews, and repeat stays! Bright lighting to complement natural light is best to accommodate all possible activities. Consider investing in some floor and table lamps in addition to any overhead lighting. Dimmer switches are a great affordable option that allows your guest to adjust the brightness to any activity. Choosing the right colors, styles, and fabrics for the walls and furniture in your Airbnb helps create a unique, calming aura. The goal is to optimize the natural light of each room. Keep furniture colors as neutral as possible and provide pops of extra color using pillows, throws, area rugs and wall accent pieces. Durable furniture fabrics are a plus to avoid needing to purchase replacements each year. Unique home decor stores like Chairish.com offer colorful and eclectic collections of furnishings, draperies, throw pillows and accent pieces to give your vacation rental a faraway and exotic feeling. For the more budget-friendly host, stores like IKEA and Amazon can give you just the right touches for your taste and budget. Local artisan shops are great for paintings or photos of surrounding scenery to add a taste of the area’s personality to your vacation rental. Wi-Fi, Netflix and Apple TV keeps your guests connected and entertained while on vacation. Black-out curtains to bedrooms to ensure quality sleep any time of day. A blow dryer in each bathroom. An iron and ironing board in one of the bedroom closets (these are actually essentials if you tailor your rental towards business travels). Each room should have a quality mattress, pillows, and extra blankets and sheets in each closet; make sure each bed has a fresh mattress pad, too. For spills and accidents, keep a vacuum cleaner, mop and bucket, and a broom and dustpan in the closet nearest the kitchen. From a designer finishes to guaranteed Wifi, your Airbnb must match the details provided in your Airbnb listing, especially in Chicago. One of the greatest features of renting an Airbnb is being able to see the place before arrival - no guessing! Airbnb is there to give travelers peace of mind, so you have to hold up your end of the deal and deliver on your promises. To say that great photos are important for your Airbnb is an understatement, especially in a competitive airbnb market like Chicago. They’re one of the first things prospective guests look at when considering a property on Airbnb - and can make or break your listing. Simply, listings with beautiful photos receive more eyes and more bookings, so take some time to make them glimmer. Draw in potential guests, highlight what is unique about your space, and set their expectations appropriately. Light is a photographer’s best friend. It brings out natural depth, color, and contrast in a setting. Great lighting makes your photo look more professional. Shoot during the day, turn on all the lights, open the curtains and let in all of the natural light. Most modern cameras will adjust for bright spots by darkening the rest, so focus the camera away from the windows if possible. Stage your home and remove the clutter. You're goal is to direct the viewer toward what makes your listing unique, not the random junk in the place. Make your place seem more inviting and spacious. Pretend you’re an interior designer —arrange flowers, fan magazines, dust surfaces. Clean up, but be sure the photo aligns as closely as possible to the actual space when they arrive. Generally speaking, more is more, so the more photos you have the more excited people will be to browse them. It provides your guest with the most reference to make their decision. Try not to shoot the same thing a hundred times, but throw in a variety of subjects. Go broad, go detailed, and give potential guests a great idea of what your space is really like. If you are not able to greet your guest and exchange keys (or hire someone to), there are a few key-less entry options. This can be in the form of a lock-box or a keypad entry. Some home-installed key-less locks even allow you to see the guest in a camera from your smartphone. Welcome your guests to "local-living"
There are many reasons travelers decide to book an Airbnb opposed to a hotel. One of them is to live like a local. That can mean something different to every guest, but it almost always comes back to staying in a local neighborhood, relaxing in a more intimate setting, and not feeling the pressures put on by a hotel. Remember: Keep it comfy. Whether that means having your kitchen ready for a guest to cook themselves dinner or having your wifi and TV easily accessible, it’s important to make your guests feel at home in your airbnb..
Cleanliness creates a comfortable space, and living like a local is about being comfortable. Your guests are expecting a level of cleanliness when they show up to your home. Make sure your apartment is white-box clean. They may have booked a stay in a home, but they will still expect some things to feel like staying in a hotel. There is nothing more useful to someone new in a city than a tour guide, or at least a local check-in guide. You may be worried that this is a difficult task, but it is as simple as creating a Google Doc. Each guide can include important details regarding your airbnb in Chicago such as wifi info, Netflix login, or specifics like where the extra towels may be or how to use the Jacuzzi. The guide also provides recommendations for the neighborhood. It gives your guests ideas on where to find the best coffee or Italian restaurant, where the closest drugstore is, and so much more. No matter how you decide to offer suggestions and information to your guests, remember it’s an important aspect in helping them feel like a local. Be available 24/7 to give guests local recommendations, and to make them feel at home. If your guest has a question or if an issue arises while they are staying with you, being accessible to them helps avoid problems. This may be one of the harder points to keep up on. You may be one of many hosts that rent your home on Airbnb while you travel or as a secondary property you own. While away, it’s not always easy to respond immediately to a question from your guests. Despite these things, do your best to get back to any questions as quickly as possible. Your “home away from home” is the reason people choose to spend their time away in your airbnb. Much like technology, it doesn’t matter how fancy or how much money you put into your Airbnb if it’s not “user-friendly” it’s of no use. How do you make an apartment user-friendly? It’s easy, pretend your guest has packed nothing! Make sure everything serves its full purpose and is ready to be used. If there is a desk, provide pens and paper. Keep the bathroom fully stocked with all toiletries including soap minis, toothbrush, toothpaste, and plenty of towels. In the fridge keep a few essentials like a pack of bottled water. Coffee and tea are also a must. Provide dishes, cups, cutlery, pots, and pans- everything one might need if they wanted to make full use of the kitchen. Keep Wifi and Netflix passwords on display along with any numbers in case of emergency. And though it’s an ancient relic, a house phone could be of tremendous use. Making your apartment Airbnb friendly means making it move-in and live-in ready. This has been stated before, but is worth repeating - your Airbnb must be CLEAN. Not like your mom came over and dusted, clean. More like, professionally detailed, type clean. Smell is one of the first impressions - make sure it’s a pleasant one with candles, plug-in, or incense. Keeping a scented plug-in is always a good option but go for a universal smell like “clean linen." Keep cleaning supplies available to guests. Paper towels, broom with a dustpan, spray cleaner, trash bags, and a sanitizer is a good start. To-do lists are a fool-proof way to get all the necessary steps onto paper so you can relay the information to yourself or helpers. When it comes to cleaning your home, a checklist may be the only answer you need. Consider organizing your list by tasks that need to be done 1) after each stay. 2) be completed once a month or so (such as re-stocking firewood, toilet paper, etc. ), and 3) others that may not need to be done as regularly. You can also use a comprehensive checklist to list specific information or requests for your guests, such as throwing used towels into a basket or taking out the trash. Asking your guests for help you keep the place clean can save you and your cleaners a lot of time. Return furniture to its pictured position. Leave used towels and sheets near the washer/dryer. Wipe countertops and wash or put away any dirty dishes. Remove any open/perishable food from the fridge or cupboards. Close the windows, and lock the doors. Providing this list for guests at the start of their stay will guarantee a swift, smooth exit and in turn, will start your cleaning process on a positive foot. Jotting down tasks in an organized manner is a bit of an obsession for some folks; others can easily do without them. If you are not a list maker, never fear. Simply search for a pre-made checklist on the Internet, and make it your new go-to. Establishing a routine for the post-guest process is the most effective way to keep things organized. Similar to a checklist, a routine is good for those who prefer to dive right into things and forego any planning. This is fine, as it truly does work. Once you perform a series of tasks repeatedly, you are likely to settle into a routine—intentionally or not. If you are in this boat, however, be sure to keep checking your work for forgotten dust balls or lurking crumbs. No one is perfect, and even the list makers will need to double down! After guests turnover, be sure to assess your property to make sure there aren’t any major issues or damages. Give each room a quick once-over, and make mental notes of the cleanliness. Depending on what works best for you, you can also try grouping similar tasks together. For example: Round one: bathrooms. Round two: bedrooms. And so on. Skip the elbow grease, and go pro. Most rental owners chose to hire professional cleaners or property managers to help with turnover. In this case, it’s beneficial to write up a quick checklist for them to have. Most cleaners will perform the same routine with each visit, but if there’s a certain issue that needs to be taken care of, be sure to mention it explicitly. If you do choose to hire professional cleaners and are typically on a tight schedule, help them out! Professional cleaners come to clean counters, furniture, and floors. If these surfaces are covered in papers, toys, dishes, and clutter, they can't do the job as well or as quickly. By going through your rental property immediately after guests leave to “clean for the cleaners,” you can help the job get done faster. This is your ultimate guide to turning your home into an airbnb. These are the guiding principles to help you make the right decisions and more simply create the space you want guests to enjoy. What else can you think of to make your Airbnb a home-run?